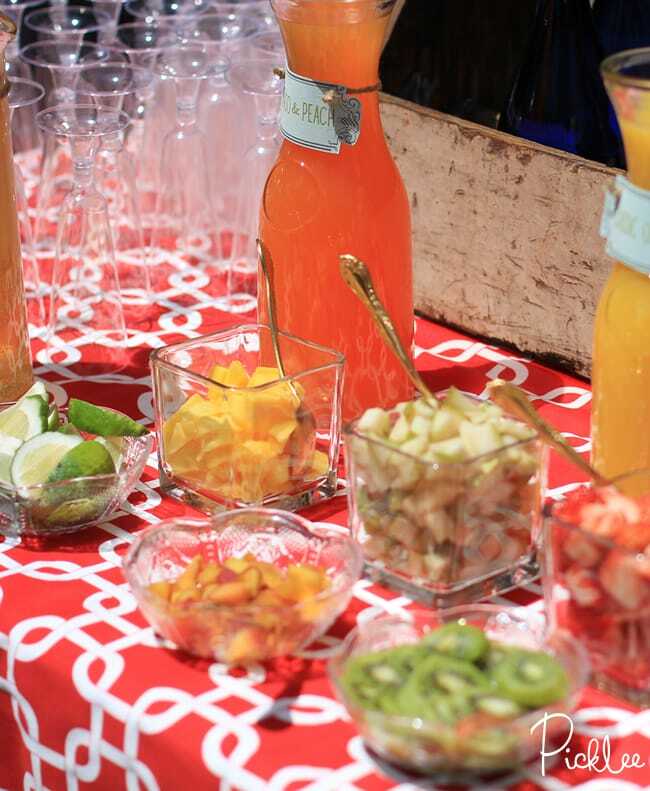 Why don’t you… Create a Champagne Mimosa Bar? On Monday I shared the DIY Fabric Scrap Banner I crafted for my sister’s wedding shower, and I told you there would be many more details to follow…well I wasn’t kidding! 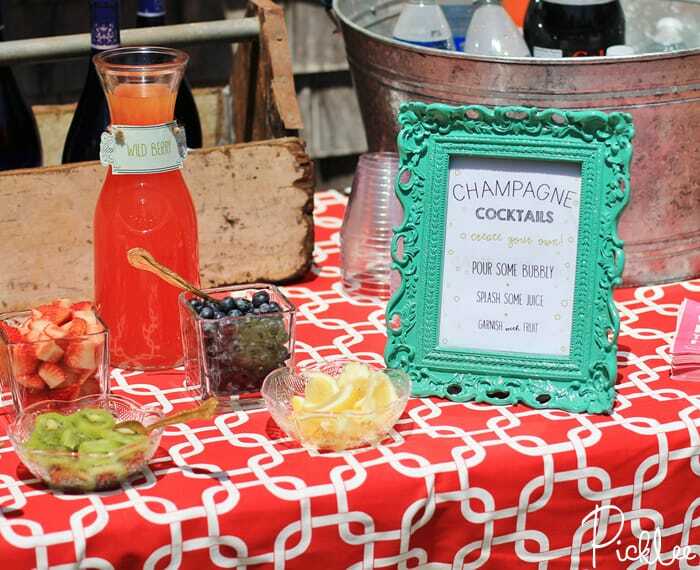 You may have caught a glimpse of the champagne cocktail/ mimosa bar in one the photos from Monday’s post…so now I’m sharing details on how you can create your own, including free mimosa bar printables! 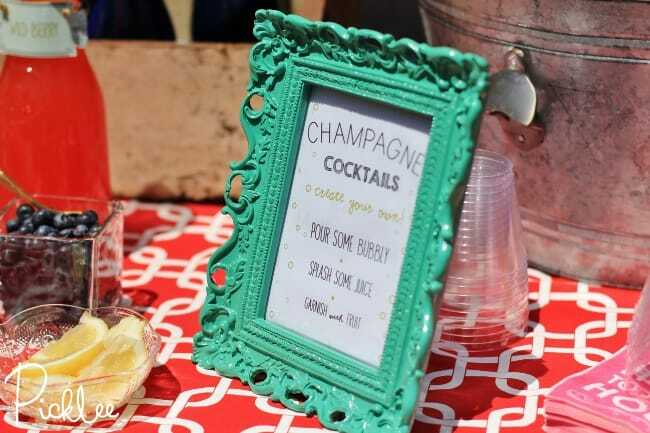 Use these free champagne cocktail/ mimosa bar printables for your display! I printed my tags on light blue card stock, but you can use any kind of heavy paper. To attach the tags, I punched holes in the corners and wrapped around the carafes with twine. A couple hours before beginning the champagne cocktail bar, cut fruit into small diced pieces & refrigerate. About an hour before beginning, pour ice into a large tub & chill champagne. Display diced fruit in bowls with spoons & fill carafes with fruit juice. 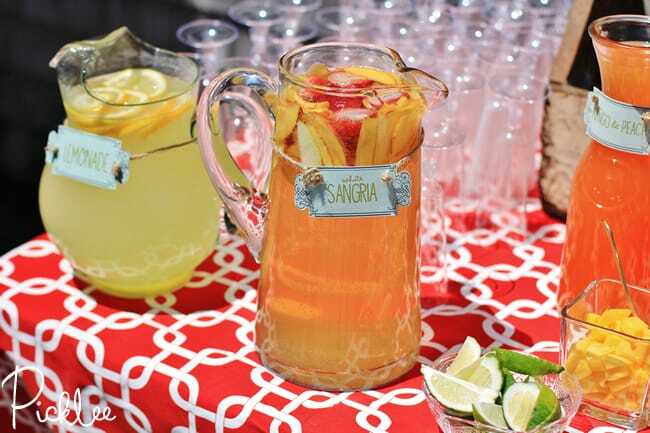 Add any other refreshments you’d like, I added fresh lemonade & white sangria to my display! 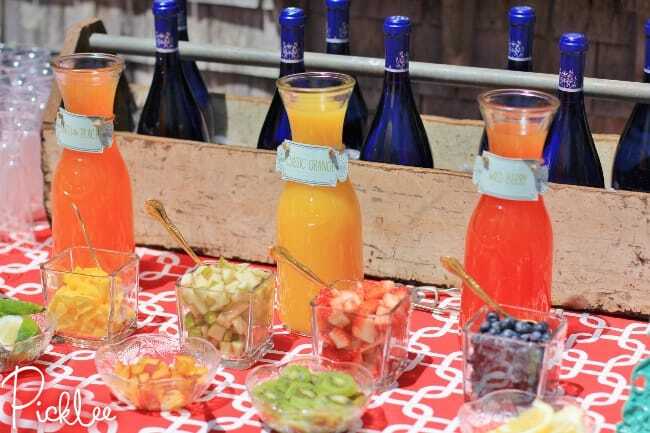 The DIY Mimosa bar is a fabulous concept for a wedding shower, baby shower, or just about ANY celebration because it’s super fun & interactive! Guest will have a blast sharing & creating their own unique concoctions. Presentation is key! Be sure to use glass juice carafes & nice dishes to display the fruit for the right effect. Luckily the supplies are super inexpensive, I found mine at the Dollar Tree & you’d never know it! 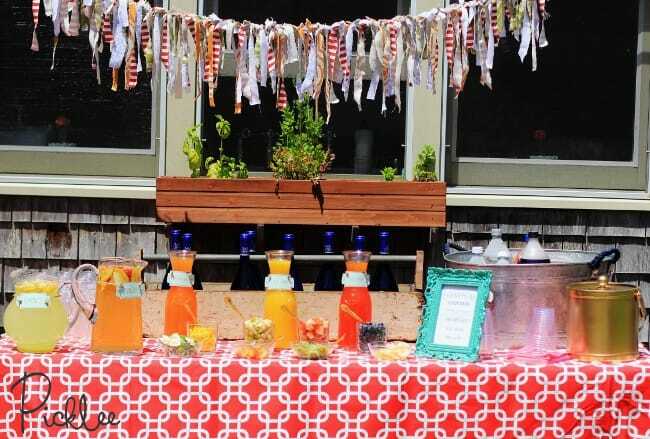 I added a white sangria & fresh lemonade to my display just to give guests a bit more variety! Here’s the big picture with the festive fabric scrap banner too! I love this idea. The only thing that would concern me is if kids (or rebellious teens) get into it. Just wondering where you were able to find disposable champagne flutes? I have been searching for a couple months and have not been able to find any! Yes! I think I got them from Target!